Northern spring is the best time to spot one of the loveliest sights in the heavens: Earthlight reflected from the Moon. April 12, 2002: It was just before dawn one morning not long ago when I was driving down a twisty mountain road. The yellow middle line was swishing back and forth like a cat's tail: it took plenty of concentration to follow the curves. I spotted something over the ridge that took away my breath -- and my attention. The next thing I knew, I was screeching to a stop at the margin, no longer sleepy. Above: At dusk, a thin crescent moon with Earthshine shines romantically over the Cabrillo Lighthouse on San Diego's Pt. Loma. Credit: Dennis Mammana. Rising before the Sun that day was an exquisite crescent Moon with the bright planet Venus nearby. The Moon was a whopper, swollen by the well-known illusion that makes moons near the horizon seem big. But that wasn't what grabbed my attention. The wonderful thing was the way the "dark" part of the Moon was faintly glowing. Leonardo Da Vinci explained the phenomenon nearly 500 years ago. He realized that both Earth and the Moon reflect sunlight. But when the Sun sets anywhere on the Earth-facining side of the Moon (this happens every 29.5 Earth-days) the landscape remains lit -- illuminated by sunlight reflected from our own planet. Astronomers call it Earthshine. It's also known as the Moon's "ashen glow" or "the old Moon in the New Moon's arms." The view from the Moon itself must be stunning. When the Moon is new, or nearly so, Earth is a dazzling, fully-lit orb in lunar skies. Blue and green and swirling white, our planet would appear four times wider than the Sun and 50 times brighter than a Full Moon. I envy future astronauts who visit the Moon and stay long enough for sunset. Meanwhile, we can enjoy Earthshine from our own planet. Northern spring is the best time to see it. Scientists in recent years have studied the Moon's ashen glow to discover how much sunlight our planet reflects -- a key datum for global warming studies. They've found that Earthshine is most intense -- about 10% brighter than average -- during April and May. Phil Goode of Big Bear Solar Observatory is principal investigator of Project Earthshine, a NASA-supported effort to monitor Earth's albedo (the astronomer's term for reflectivity). 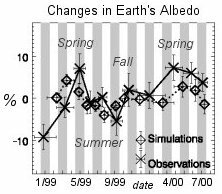 He says, "it's not surprising that Earth's albedo changes with the seasons." After all, most of the sunlight reflected from our planet is reflected from clouds -- and cloud cover changes from one season to the next. 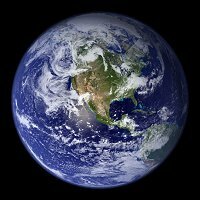 Clouds dominate the "shininess" of our planet, adds Goode. "They reflect about 50% of the sunlight that hits them -- more than oceans (10%) or land (10% to 25%). Only snow and ice reflect more (40% to 90%) than clouds do, but snowy areas tend to be cloud covered anyway." Although the spring peak wasn't surprising to Goode, its size was. The extra Earthshine in April and May was about twice as much as computer models predicted based on actual satellite observations of ice and cloud cover. It's a lingering mystery. Left: A Project Earthshine study of Earth's albedo revealed peaks during northern spring. From "Earthshine Observations of the Earth's Reflectance," by Goode et al, Geophysical Research Letters, Vol. 28, no. 9 (May 1, 2001), pages 1,671-1,674. There are faster changes, too: As our planet rotates, different parts of it turn to face the Moon. To a lunar astronaut, the Pacific Ocean would appear relatively dark -- like a maria on the Moon itself. On the other hand, a big cloud-covered continent like Asia could reflect two or three times more sunlight than Pacific waters. For this reason the Moon's ashen glow can wax and wane from hour to hour -- "at the 5% level," says Goode. Look for the changes. Enjoy the glow. Just don't gawk and drive. Leonardo Da Vinci's explanation of Earthshine -- (American Museum of Natural History) The Codex Leicester, written between 1506 and 1510, opens a window onto the mind of the awe-inspiring Renaissance artist. Our planet's average albedo in recent years is 0.297 plus or minus 0.005 according to Project Earthshine researchers. For more information see "Earthshine Observations of the Earth's Reflectance," by Goode et al, Geophysical Research Letters, Vol. 28, no. 9 (May 1, 2001), pages 1,671-1,674. The Inconstant Moon -- an invaluable guide to Earth's moon. Patterns in the Sky -- (Salisbury State University) This astronomy lecture by Dr. Joseph W. Howard includes diagrams of Moon phases and explains the basics of Earthshine. Join our growing list of subscribers - sign up for our express news delivery and you will receive a mail message every time we post a new story!! !